The WZ-122 project was a late Cold War Chinese medium tank project, designed in the context of the Sino-Soviet split. The main goal was to create a tank to rival other Main Battle Tanks (MBTs) of the epoch, such as the Soviet T-62 and German Leopard. At this time, relations with the Soviet Union were deteriorating and China was not going to be getting any new tanks or technological assistance from the Soviets. The Cultural Revolution had also just started, which would have a very negative effect on tank engineers, who were often deemed as part of the educated class and purged. 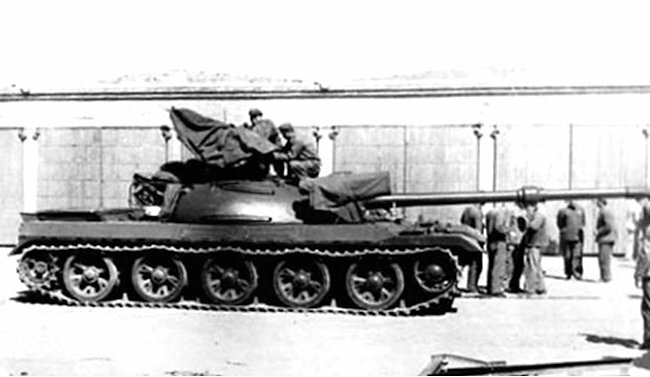 After capturing and reverse engineering a T-62 tank in the Sino-Soviet Border Conflict (1969), the WZ-122 project began. The first iteration, the WZ-122-1, featured 4 wire-guided missiles and a 120mm smoothbore gun, but did not reach past the prototype stage. In the late 1960s, China was still using the Type 59 (a license production of the T-54A) and tanks derived from it. Due to a range of technical and political issues, many WZ-122 projects never left the prototype stage, including the WZ-122-1. Chinese Army WZ-122-1 main battle tank prototype. Notice the four anti-tank rockets mounted on the side of the turret. The WZ-122-1 development began after the Sino-Soviet Border Conflict of 1969, when China captured a T-62 tank (tactical number 545) from the USSR, which was reverse engineered shortly after. As China would no longer receive Soviet-licensed tanks, it needed to develop its own tanks to keep up with current armor developments. 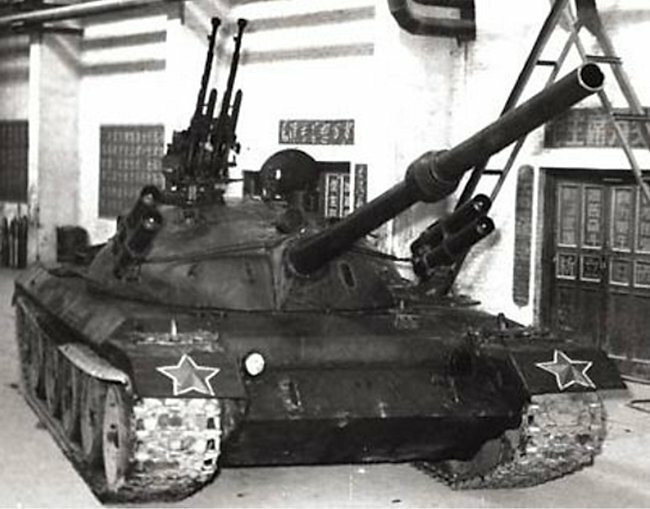 One of these new tanks was the Type 69 (factory designation WZ-121), which used technology from both the Type 59 (WZ-120) and the captured T-62 tank from the USSR. Despite this, China was not satisfied with the tank, as it was close in design to the old Type 59. This is where the development of a new tank and new chassis begins. Wanting an advanced tank, the WZ-122-1 was designed with a hydropneumatic suspension and modern main battle tank technologies. Later, however, this design was deemed too complicated, so the simplified WZ-122-2 was made. The WZ-122-3 was further simplified by using the Type 69 chassis and would eventually lead to the Type 80. The project was ultimately canceled after engineers were executed, being deemed traitors during the purges of the Cultural Revolution. However, the project was revived with the WZ-122-4. There is some ambiguity about the name of the WZ-122-1. It is sometimes merely called the WZ-122 or the WZ-122A, especially in non-Chinese sources. The vehicle is likely to be called the WZ-122-1 though, due to the fact that the WZ-122-3 is accounted for being the vehicle after the “three-mechanical” (WZ-122-2) vehicle. The development of the ‘three mechanical’ (WZ-122-2) followed the ‘three liquid’ (WZ-122-1) and the names are derived from the technologies used. The term “three-liquid” is used to refer to the three new hydropneumatic technologies on the tank: the suspension, the clutch, and power steering. The term “three-mechanical” is used due to the removal of the hydropneumatic technology from the three elements. 1. The tank needed a more powerful gun of larger caliber than previous designs, capable of engaging current and future medium and heavy tanks from any foe. 2. Larger ammo capacity than previous designs, such as the Type 59 which carried 34 rounds, as well as being able to carry new high explosive shells for the main gun. 3. New devices, including night vision equipment, rangefinder, and 2-axis stabilizer. 4. Reduced weight and size, with a stronger engine that required less fuel. 5. Improved materials for armor with a “reasonable” amount of armor. Improved protection against High-Explosive Anti-Tank (HEAT) ammunition. 6. Nuclear Biological Chemical (NBC) protection. 7. Improved reliability, decreased maintenance, easier to operate. 8. Noise reduction for crew comfort, crew can stay in tank longer. Chinese WZ-122-1 line drawing showing bad weather tarpaulin rolled up in the rear stowage rack at the rear of the tank turret. The first WZ-122-1 was finished on September 25th, 1970. The tank fulfilled the larger and more powerful gun requirement. The WZ-122’s main gun was a 120mm smoothbore cannon with 40 rounds of ammunition. This gun had Armor-Piercing Fin-Stabilised Discarding Sabot (APFSDS) rounds developed from the 115mm smoothbore rounds from the T-62. The gun weighed 2563 kilograms, had a length of 5750mm, and had a rate of fire of 3 to 4 rounds per minute. It was able to depress 6 degrees and elevate by 18 degrees. The gun would later be further developed and used on the Type 89 tank destroyer. The tank had a 7.62mm coaxial machine gun with 3000 rounds. The vehicle had two 12.7mm AA machine guns on the turret with 500 rounds. Originally, a 20mm autocannon was planned for the WZ-122 but was deemed too heavy. Four ATGM missiles were fixed on the side of the turret. These missiles were an early precursor of the HJ-8 missiles. The WZ-122-1’s layout was similar to most other Soviet and Chinese tanks of the time. The driver was situated in the left of the hull. The gunner, loader, and commander were in the turret. Equipment on the vehicle included a CWT-176 radio system, a ballistic computer, and active infrared night vision for the crew. The night vision equipment proved the most difficult to install on the tank due to bottlenecks in its development for the vehicle. The WZ-122-1 had an experimental hydro-pneumatic suspension and a 515 kW (690 horsepower) engine and weighed 37.5 tonnes. The vehicle managed to reach a road speed of 55 km/h. This suspension did not allow the WZ-122-1 to tilt or raise its suspension but merely to improve the tank’s ride as per the tank’s requirements. It had 5 road-wheels and no support rollers. The transmission had three forward gears and one reverse gear. However, the hydro-pneumatic suspension was deemed too complicated, so, in November 1970, a tank with a conventional suspension was made, designated the WZ-122-2. This tank also had an engine with reduced power: 478 kW (641 horsepower). The engineers of the WZ-122-1 project were purged in the Cultural Revolution due to being a part of the educated class. The complexity of the project also factored in its cancellation. The WZ-122-1 was replaced by the WZ-122-2 vehicle, also known as the ‘three-mechanical’. This vehicle was essentially a simplified WZ-122-1. However, the WZ-122-1 would lead to the development of many WZ-122 variants and tanks outside of the WZ-122 series, such as the Type 80 series of tanks. Various WZ-122 vehicles survive to this day in China. Tank crew fitting bad weather tarpaulins over the WZ-122-1 tank’s anti-aircraft machine guns and anti-tank rockets. Suspension WZ-122-1 adjustable Hydro-Pneumatic “Three-Liquid”. The WZ-122-1 prototype, also known as the ‘Three-Liquid’. The specific missile mounts are clearly visible. Illustration by Jaroslaw ‘Jarja’ Janas, corrected by Jaycee “Amazing Ace” Davis.